We use superior-grade packaging as barrier protection for our products against dust, moisture, mechanical damages and logistical jostling. Our products packaging is premium. We settle the financial transactions with our customers through the secured payment procedures. We also settle down upon a variety of negotiable instruments. 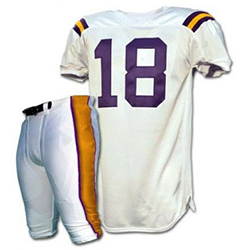 WB-1608 American Football Uniform is highly breathable with a comfortable design and is available in a quality packaging.